Esther goes into the throne room without asking for an audience; which is normally punished by death, even for the king’s wife she is. While she is exiled in Babylon like many Jews, her beauty has allowed her to become the wife of King Ahasuerus who does not know her religion. Being informed of a plot against her people, she has decided to speak to the king. Either the latter welcomes her as his wife and holds out his sceptre towards her, or she is so troubled that she faints and, unsteady on her legs, she is supported by her maid-servants. This is a royal scene with its scenery, its costumes and the attitudes of its characters. Solomon and the Queen of Sheba; Lucas de HEERE; 1559; St Bavo cathedral, Ghent, Belgium. have nothing in common but both of them are received with solemnity by a king. These two scenes then have a similar structure, the same sumptuous oriental scenery but it is often easy to distinguish between them by observing the two women: The Queen of Sheba often assumes a very proud attitude whereas Esther, on the contrary, knows that she risks her life coming to see the king, she lacks confidence. In both these works, Tintoretto has amused himself to spread confusion. Esther is a young beautiful Jewish girl, exiled in Babylon with the whole people of Israel. 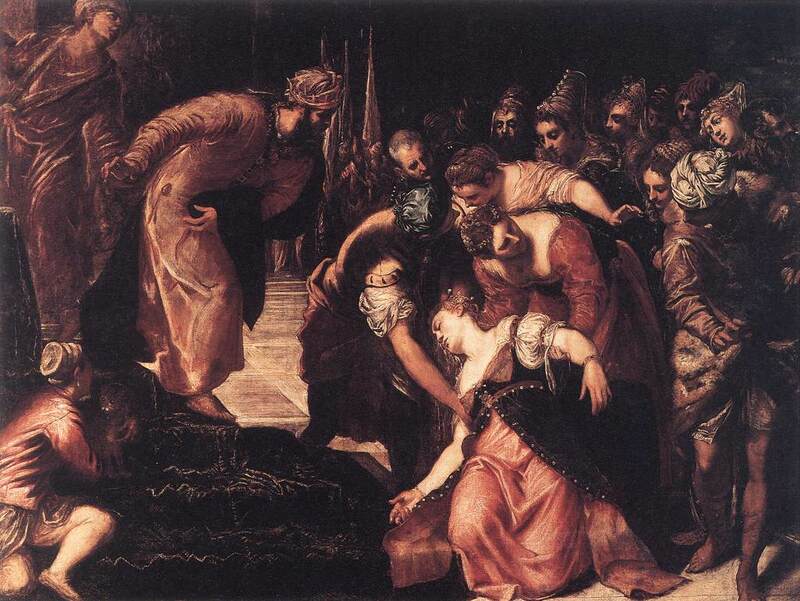 King Ahasuerus, who is looking for a wife, chooses her for his queen but she conceals her Jewish origin. Her uncle Mordecai, a loyal subject of the king, denounces a plot and saves his sovereign. But he meets the anger of the High Vizier, Haman, in front of whom he refuses to bow down. Mordecai then decides to ask Esther to intervene to save her people. Then the king said to her, What do you want, queen Esther? and what is your request? it shall be given to you up to half of the kingdom. And Esther answere:, If it seems good to the king, let the king and Haman come this day to the banquet that I have prepared for him. Then the king said, Cause Haman to make haste, that he may do as Esther has said. During the night, King Ahasuerus, who suffers from insomnia, discovers, when consulting the archives, that he has been rescued by Mordecai. During the supper organised by Esther, the king extols Mardocai who reveals to him that he is a Jew; so is Esther. He asks him to suppress the decree of extermination prepared by Haman. The latter is confounded and hanged up; the Jews are saved and the king allows them to defend themselves against their aggressors. 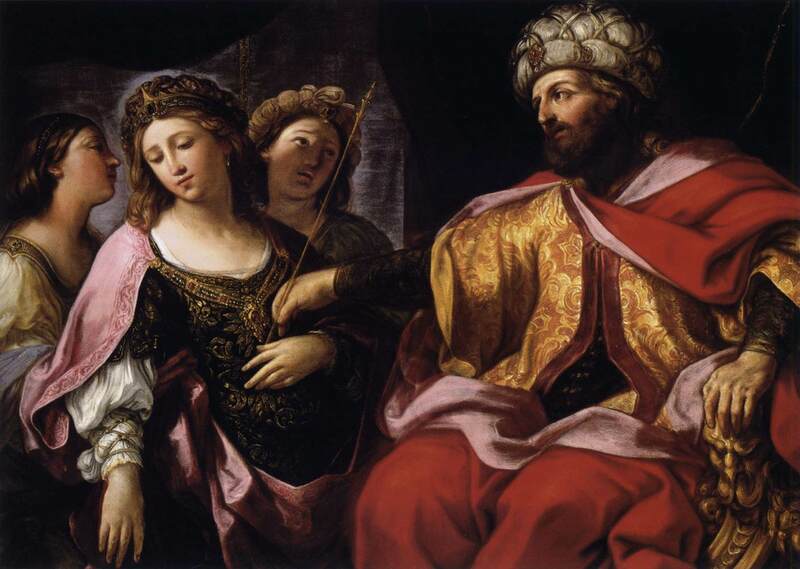 Esther’s story takes place during the ordeal of the Exile in Babylon in the 5th century BC under the reign of Xerxes, whom the Jews call Ahasuerus. It is the fictionalized story of a beautiful woman who is going to save her people from extermination. Her Persian name means “star” but the Jews refer it to “seter”, that is to say “secret” since the young woman conceals her Jewish origin until the final unexpected turn of events. This shows that God also acts in a secret manner. 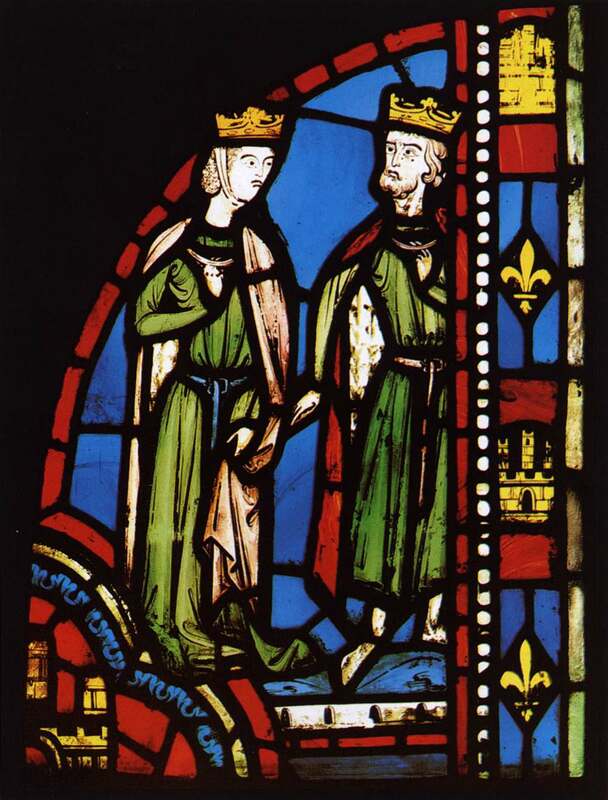 The Middle-Ages transformed the scene into a possibly typical Court ceremony. Esther before Ahasuerus; c. 1465; miniature from “Bible moralisée”; manuscript KB 76 E7 80r; Koninklijke Bibliotheek, The Hague. 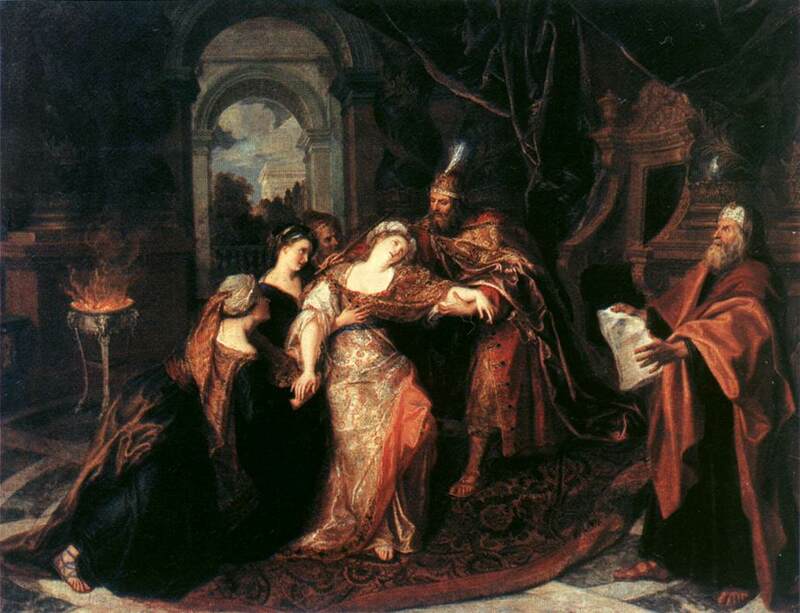 Esther is received by King Ahasuerus who touches her with his sceptre. She is in a position of total submission. Esther’s fainting is also another way to treat the meeting. Esther before Ahasuerus; Nicolas POUSSIN; 1640 oil; on canvas; the Hermitage Museum, St Petersburg. Esther before Ahasuerus; Valentin LEFÈVRE; c. 1675-1700; oil on canvas; the Hermitage Museum; St Petersburg. is the national Jewish heroine par excellence since she has saved her people from genocide. She is celebrated every year at Purim, on the 13th and 14th of the month of Adar, in February or March. The name of “purim” means “lots” since the vizier Haman had fixed by lot the day when the Jews were to be killed. This is a very popular feast taking the form of a true carnival with masquerades and theatrical performances. Disguised children distribute gifts to the poor, grown-ups organise washed down banquets. It is the opportunity to exercise Jewish humour and to laugh at a persecutor. Esther has also inspired a certain number of Christian writers, among them Jean Racine who wrote a tragedy in her honour in 1689. The play, enhancing the value of sacrifice and will, was intended for the demoiselles of Saint-Cyr, a school founded by Madame de Maintenon near Versailles.